From the very first time you dim the lights and slip down into your favorite sofa to take in a Blu Ray movie on your brand new 82 inch TV you’ll understand what total immersion experience really feels like. From ten feet away the screen will fill your entire field of vision making you feel just like you were in the movie – this is not a movie going experience it is something far different, far more exciting. Even movies you’ve seen a hundred times will offer a far more intense viewing. This is the way action movies were meant to be seen. Add in the 3D possibilities and this set will be the focal point of your home for years to come. 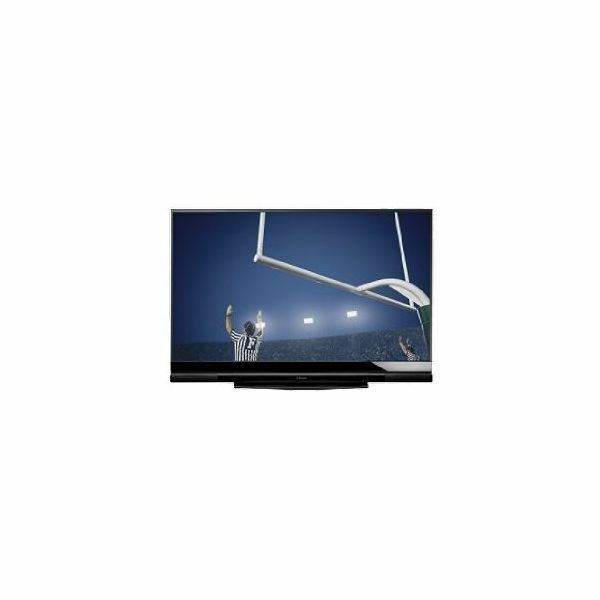 This Mitsubishi offers the latest 1080p DLP screen with fifth generation 12-bit processing that results in an image free from artifacts or pixilation even during high action sequences and sporting events. There are five preset viewing modes including: Brilliant, Bright, Natural, Gaming and Advanced. Changing between modes requires the simple push of a button. The Mitsubishi offers the latest HDMI 1.3 interface along with 36 bit Deep Color and v.v Color equalizers. The sound system is just as amazing as the picture with deep base and treble that doesn’t sound pitchy or tinny. The 10 watt speaker system is fine for watching movies but if you were to pair this television with a home theater system the upgrade would be worth your while. The TV doesn’t skimp on inputs either. There are 3 HDMI inputs, 3 combination component/composite inputs (2 on the back one on the side) and a PC/DVI port as well as stereo and digital audio outputs. Connect this monster to your Blu Ray player, High Def gaming system, digital audio system and/or HD camcorder and play home movies in theater quality. Add in the digital tuner and you have everything you could every need in a home theater system. Physically this isn’t much more than a screen and speaker system. It isn’t a rear projection monster measuring in at 73.2" x 48.5" x 22.7". For 7 feet of viewing space this is ridiculously small. When the 3D capabilities are fully realized and this television is the only thing in your field of view you’ll really feel like you’re in the scene with the actors. It will be almost like the holodeck on the Starship Enterprise with nothing to interrupt your suspension of reality. Now imagine the using it with the Xbox Kinect or Playstation 3 Move. It will usher in a fully interactive and immersive experience in your own living room. Not only will this be great for gaming but there’s no doubt your house will be the place to be for all the big sporting events. Who wouldn’t want to watch the Super Bowl on this television? The kicker to this whole deal is that the current price is $2039.99. No, that’s not a typo – this TV, the Mitsubishi 82 inch TV, is less than $2500 – less than several 50" HDTVs on the market today.